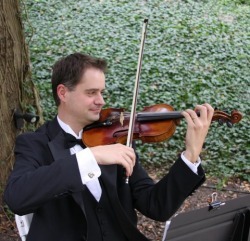 A few words about the artist..
​Oleg performs professionally with various regional orchestras, including the Asheville Symphony, where he is permanent fourth chair, the Hendersonville Symphony Orchestra, Symphony of the Mountains (Kingsport, TN), and others. Since 2001 he has maintained an active private studio and taught hundreds of students in Western North Carolina. In addition, many weekends are filled with weddings, studio recordings, and private recitals with his piano trio, Trio Sussurando and Asheville String Quartet. Wedding music repertoire consists of number of pieces that create unique and wonderful ambiance for a wedding. Music selection consists of songs that belong to different categories such as: Prelude, Seating of mothers/grandmothers, Procession of attendants, Bridal procession, Ceremony music, and Recessional. For Prelude, there should be about five songs played when the guests are seated, then a special song when the mothers of the bride and groom are seated. There are two songs during the processional, one when the bridesmaids enter, and the most dramatic as the bride walks up the aisle. The most joyous music is played in the recessional, when the bride and groom leave together as husband and wife for the first time. Special songs can be placed at different times during ceremony, such as after exchanging the rings and vows, lighting the unity candle, or taking communion.